Recent engineering enhancements to the EU Stage IV Cat® M Series Small Wheel Loaders (SWL) – 926M, 930M and 938M, as well as the K Series models (924K, 930K, 938K) – advance equipment value through new standard and optional features that boost productivity, improve operating ease and increase uptime reliability. A new secondary display module option for all models within the product line improves operator interface and navigation, and it makes available a host of special payload management and service options. The new touchscreen display features a QWERTY keyboard, making it easier for the owner/operator to navigate through the menu and input text like coded start operator profiles, application profiles, service-mode and preventative maintenance alerts. The new display significantly reduces the amount of time for information entry and eliminates the arrow keys required by previous versions for navigation and data inputting. A first for the Cat small wheel loader models, adding the touchscreen display and Product LinkTM Elite to these small loaders ushers in the availability of Caterpillar Payload Management. The management system’s tip-off capability confirms to the operator that there is sufficient weight in the bucket before leaving the pile, increasing machine productivity. When this Cat feature is active on a 924K, 926M, 930K, 930M, 938K or 938M, it gives the operator the ability to place the proper amount of material in the mixer, hopper or truck the first time, every time, reducing the number of cycles and maximising profit potential. Caterpillar Payload Management allows the operator to set target loading weight and monitor the cumulative amount of material loaded into a truck or hopper, which helps to prevent overloading. Additionally, the available system printer gives the operator the ability to print up to three copies of a recorded weight ticket. Since Caterpillar Payload Management is fully integrated into the machine, the site manager can track important statistical information like amount of material moved and number of trucks loaded with the use of VisionLink®. 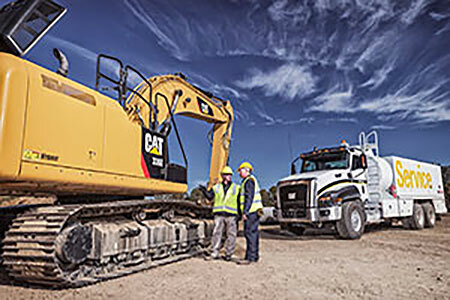 Enhancements to Cat Auto-Lube include the replacement of rubber hoses and swivel joints with steel lines running to the bucket pins, improving system durability. New secondary perks added to the system enable the operator to manually grease circuits, should the need arise. To save time, the technician can add grease quickly to the new main manifold, which greases every circuit on the loader, or specific individual circuits can be greased independently. Auto-Lube is fully integrated into the new secondary display and Cat VisionLink, which automatically sends diagnostic codes to the operator and designated key personnel like fleet managers to help with troubleshooting. Should the grease reservoir run low or other system issue arises, a pop-up banner is shown on the secondary display notifying the operator of the problem, so it can immediately be addressed. To increase tire longevity, Tire pressure monitoring (TPM), a first to market, is now a fully integrated option for the M Series small wheel loader machines. With a quick glance at the secondary display, the operator can easily see current tire pressures for each tire, ensuring they are properly inflated to reduce uneven wear and maximise tire life. The system can be configured to provide warnings to dealers through Electronic Technician and the operator via the secondary display if tire pressures drop too low or increase too high. Since TPM is a fully integrated system, fleet managers can use VisionLink to track air pressuring and temperature in each machine from a remote location for optimal machine performance and efficiency. The updated deluxe operator’s cab design offers a new standard binder/clipboard storage area for securely storing papers and manuals, while an extra 1.2 ft3 (0.03 m3) of lockable storage can be optionally mounted to the bottom side of the cab for securing tools, grease guns, gloves and other items. Climate controlled with heated rear glass and external mirrors for rapid defrost, the quiet cab design boasts seat-mounted controls featuring a low effort joystick for lift and tilt functions. The M Series SWL machines are powered by the Cat C7.1 ACERT™ engine with clean emissions module that requires no operator intervention, which avoids work cycle disruptions. The operator has the option of selecting standard mode operation that reduces maximum engine speed to 1,600 rpm without compromising peak ground performance, resulting in a 5 to 10 percent fuel savings. Full performance mode operation boosts engine speed to 1800 rpm for maximum engine power and increased hydraulic speed and power to boost production.